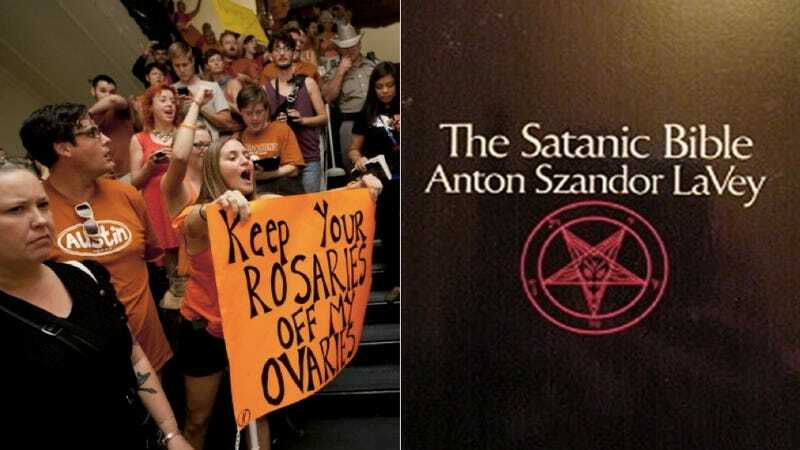 During the protests in Austin as restrictive Texas abortion bill HB2 was being voted on by the state Senate, a group of pro-choice activists began to yell (satirically) "Hail Satan!" in order to drown out oppositional pro-life chanting. PolicyMic reports that the authorized (and one unauthorized) Church of Satan group has responded to this appropriation of their sentiment. But Magus Peter H. Gilmore, High Priest of the Church of Satanism, told CNN that there's no there no actual official UK Church of Satan, and later a Tweet from the group confirmed that it was only a conduit for UK Satanists to connect with others who share their beliefs worldwide. "We generally consider the use of abortion to be the purview of the woman whose body is carrying the child... so religion should neither force upon nor deny an abortion for any woman, in our thinking. Freedom with responsibility is the hallmark of civilized behavior to the Satanist." All said and done, I'm pretty sure I have more in common with Satanism than Judaism. Who knew?